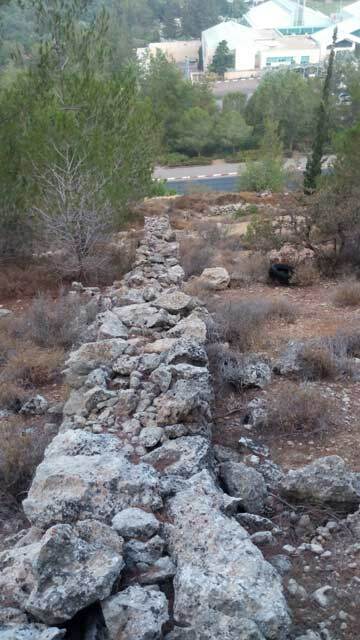 In July–September 2014, a salvage excavation was conducted in Jerusalem, on the spur on which the Manahat neighborhood is located (Malha; Permit No. A-7170; map ref. 216978–7458/628136–689), prior to the neighborhood’s expansion. The excavation, undertaken on behalf of the Israel Antiquities Authority and financed by the Ministry of Construction and Housing (the ‘Arim Company), was directed by S. Kisilevitz, with the assistance of Z. Turgeman-Yaffe, N. Shami and C. Arbib (area supervisors), A. Wiegman, D. Tanami, S. Mizrahi, and R. Cohen (tomb excavation), S. Mizrahi, L. ‘Oz, R. Forestani, Y. Kapil and M. Haber (supervision), N. Nehama and R. Abu Halaf (administration), M. Kahan, A. Hajian and M. Kunin (surveying and drafting), D. Tanami (metal detection), A. Peretz (photography), Griffin Company (aerial photography), D. Levi (GPS and mapping), B. Touri and A. Keinan (safety), R. Be’eri (pottery), N. Ben-Ari (Bronze Age pottery), J. Bukengolts (pottery restoration), B. Ouahnouna (glass), D. Ben-Ami, I. Zilberbod, Z. Greenhut, A. De Groot and Y. Frumkin (scientific consultation), L. Kupershmidt (metallurgical laboratory), C. Amit (studio photography), I. Lidsky-Reznikov (finds drawing), N. Zak (drafting), R. Cohen-Amin, A. Gavri’eli, A. Shriker and S. Abed Al-Kareem (storage), Y. Avni (geology), D. Namdar (residue analysis samples), Y. Nagar (physical anthropology), N. Porat (OSL dating), Y. Gadot from and U. Davidovich (OSL-dating samples), D. Langgut (archaeobotany), A. Amir (residue analysis), N. Marom and Z. Turgeman-Yaffe (archaeozoology), L. Weisbrod (microfauna) and D. Ilan (funerary practices). Our thanks to Y. Tchekhanovets, who condensed a report on the Georgian origins of the Malha villagers and their association with the Monastery of the Cross. The spur drops steeply south toward Nahal Refa’im. Until 1948, the village of Malha (el-Maliha) lay along the top of this spur, commanding views of extensive tracts of land (6,800 dunams) containing agricultural terraces and farm plots that stretched across the streambeds and slopes of the spur. The village is mentioned in 1596 imperial Ottoman records as located within the Jerusalem District and paying taxes on wheat, groats, varied agricultural produce, olive and fruit trees, vines, goats and beehives (Hütteroth and Abd al-Fattah 1977:118). It appears on the 1945 British survey map and in the country’s village census conducted in the same year (Department of Statistics 1945:25). The village was apparently established during the Crusader period by tenant farmers brought from Georgia to cultivate the lands belonging to the Monastery of the Cross. According to the Georgian researcher Zagareli, the villagers were still regarded as the monastery’s protectors in the late nineteenth century CE, and they had the sole right to farm its fields in return for a third of their produce (Zagareli and Guthe 1888:259–260). Although their native tongue and culture were forgotten over time, in the eyes of the local Arab population they were viewed as strangers. Furthermore, they were convinced that their origins lay in a country far to the north, referring to themselves as gurji. Surveys conducted in the late nineteenth century CE (Conder and Kitchener 1883:21, 136–137; Clermont-Ganneau 1899:459–463) documented a medium-sized village with rock-hewn tombs and many archaeological remains, some of which were on land owned by the local inhabitants. Clermont-Ganneau identified the village as the biblical Manahat. In 1948 the village was emptied of its inhabitants, and some of its houses were subsequently occupied by Jews. Some of the village buildings were incorporated into the new neighborhood of Manahat, which was built on the spur in the early 1990s. During this development work, the spur’s slopes were landscaped, including the construction of terraces and footpaths and extensive afforestation, all of which altered the natural topography and leaving empty pits across the spur. Along its lower part, above Kh. er-Ras, large high-voltage pylons were erected on wide terraces. Extensive urban development in southwest Jerusalem from the late 1970s onward and the construction of the separation barrier to the south of this part of the city provided an impetus for the archaeological research of the Nahal Refa’im basin and the surrounding region, mainly between Beit Safafa and Battir. The excavations uncovered evidence of agricultural settlements from the Intermediate Bronze Age and Middle Bronze Age II (Eisenberg 1993; Edelstein, Milevski and Aurant 1998; Greenhut, Milevski and Agha 2008; Weksler-Bdolah 2017; Zilberbod and Be’eri 2017) and from the Roman period (Edelstein 1993; Weksler-Bdolah 2007; Avner 2015). 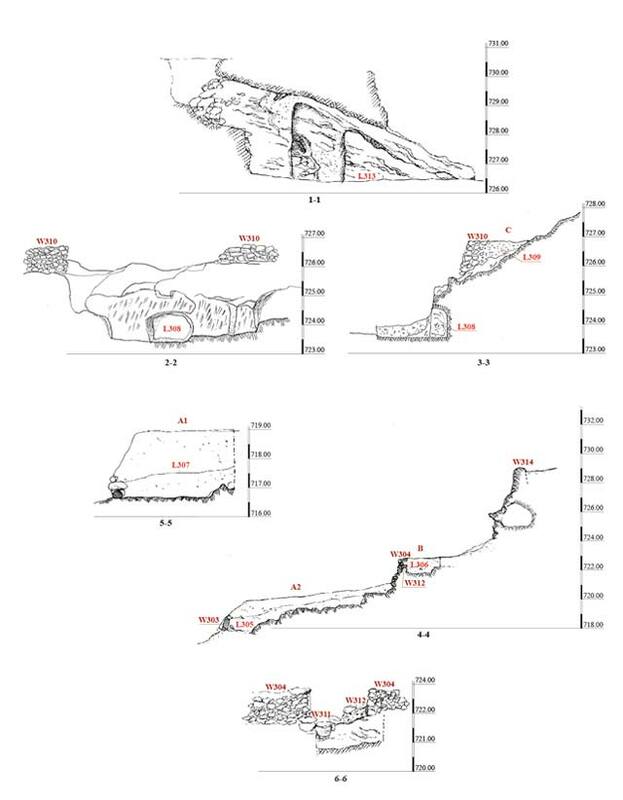 A survey conducted on the spur in the 1970s (Gibson and Barkay 1977) and another survey carried out prior to the current excavation (Wiegman 2013) documented mainly caves, rock shelters, rock-cuttings, agricultural terrace walls and field walls. Excavations on the spur preceding the expansion of the Manahat neighborhood (Zehavi 1993) identified 22 shaft tombs from the Intermediate Bronze Age and the MB II—several of which were exposed again in the current excavation—as well as remains from Iron Age II, the Persian, Byzantine and Ottoman periods and modern times. Most of the finds from the excavations at Kh. er-Ras, on the spur’s southern slope, were dated to the Iron Age IIB and the Persian and Hellenistic periods, while some date from the Intermediate Bronze Age and the MB II (Edelstein 1982; Feig 1996; Edelstein 2000; Gadot 2011; Gadot 2015; Feig 2016). The findings from Zehavi’s (1993) excavation of the shaft tombs will be incorporated in the final report of the current excavation, while the other finds from his excavation will be incorporated in the report on Y. Gadot’s excavation at Kh. er-Ras. Geologically, the spur contains three rock formations: (1) The Kefar Sha’ul Formation in the upper half (the upper part of Area A and Areas B, C and D), characterized by a layer of hard nari rock (thickness 1 m), beneath which lies soft chalk that is easily quarried; (2) the ‘Amminadav Formation in the lower half (the lower part of Area A and Areas E and F), characterized by dolomite that is difficult to quarry by hand and produces a rocky terrain, allowing for farming only in soil deposited in natural pockets in the rock; (3) the Moza Formation at the base of the spur, characterized by marl and suited to farming. The spur was divided into six areas (A–F; Fig. 1) based on its geography, topography and geology. The location of the excavation squares in these areas was based on the findings of the preliminary survey (Wiegman 2013), which documented 21 find spots, consisting mainly of caves, agricultural terrace walls and fences. The excavation uncovered part of a cemetery (Area B) containing dozens of hewn shaft tombs from the Intermediate Bronze Age and MB II, many of which were damaged by modern infrastructure work. The excavation of the tombs was halted at the request of the Ultra-Orthodox Atra Kadisha organization. A quarry (Area B), vertical rock-hewn walls and a dwelling cave (Areas C and D) and the walls of agricultural terraces and stone fences (Areas A and E) were also discovered. Trial excavations conducted in Area F, along the southern, moderately sloping side of the spur, yielded no ancient finds. This report is the preliminary report on the cemetery excavation results and the final report on the remaining findings from the excavation. In view of the importance of geological research for an understanding of the formation processes and dating of the agricultural terraces, probes were dug in the terraces along the spur’s eastern slope, and seven soil samples were extracted for OSL (Optically Stimulated Luminescence) dating. The spur’s western slope is characterized by steep rocky outcrops sparsely covered with soil. Most of the slope has been planted in recent decades with pine trees. The lower part of the slope was quarried during the construction of a modern road. The area was surveyed but not excavated; agricultural terrace walls and stone fences built directly on the bedrock were detected (Fig. 2). Although these walls and fences have not been dated, some are probably the result of modern earthworks and afforestation. The upper southern slope of the spur is characterized by a bedrock escarpment containing a parcel of land that was leveled during modern infrastructure work. This area yielded shaft tombs quarried during the Intermediate Bronze Age and reused in MB II (Phase 1), a quarry (Phase 2) and remains of a building and a modern road (Phase 3) that damaged the tombs. Phase 1. 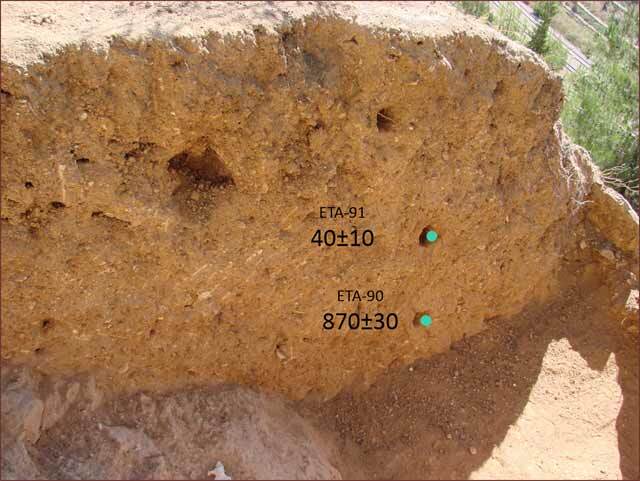 Fifty-two hewn shaft tombs were exposed along a strip of the escarpment (exposed length c. 60 m, width 20–25 m; Fig. 3) on the spur’s southern slope. Eight of these shaft tombs were unearthed in the past by Zehavi (1993); he dated them to the MB I–II. 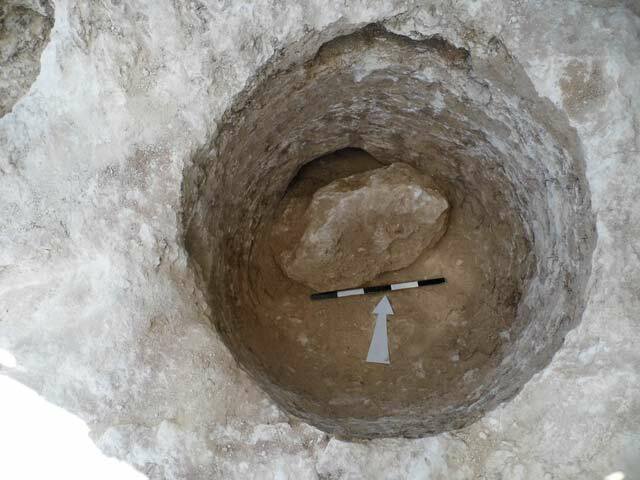 The finds from Zehavi’s excavation were not published, but the preliminary report and the excavation file in the IAA archives show that, based on the pottery recovered from the shaft tombs, they were hewn in the Intermediate Bronze Age and reused in MB II. Each of the shaft tombs consists of a round, vertical shaft (diam. 0.8–1.4 m, depth 1–2 m) cut into a layer of hard nari rock; an opening at the bottom of the shaft leads into a burial chamber, which is usually elliptical and is hewn in the soft chalk underlying the nari layer. A closing stone that blocked the opening that led from the shaft into the chamber was preserved in several tombs (Fig. 4). Intact vessels were discovered in two of the tombs (Figs. 5, 6). Most of the tombs uncovered in the lower part of Area B were damaged by modern development work. In some cases, only the lower parts of the shafts and burial chambers were preserved; these were filled with modern refuse as well as a thick layer of crushed chalk and lumps of rock from the earthworks. 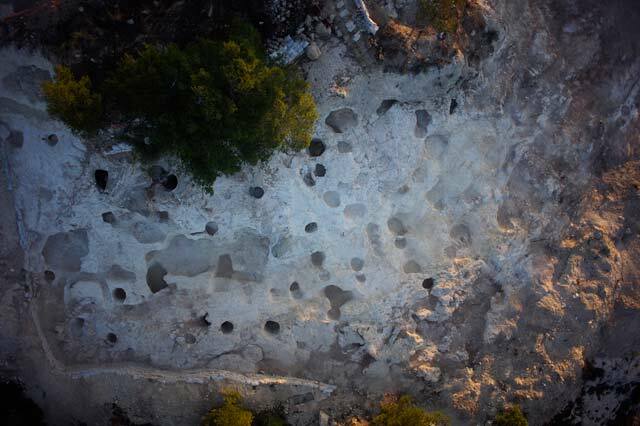 The other tombs were also poorly preserved, as the penetration of tree roots and natural weathering processes caused the soft chalk bedrock to collapse. Phase 2. A quarry (c. 36 sq m; Fig. 7) discovered on the east side of the escarpment included several quarrying steps in the nari rock layer. The limited area of the quarry and the fact that it did not extend below the nari layer indicate that only few stones were extracted here. The quarrying marks and stone-severance channels indicate that the stones were large and medium-sized (average dimensions 0.25 × 0.35 × 0.70 m). At its center, the quarry cut into a shaft tomb, whose lower shaft and soil-filled burial chamber were preserved but contained no finds. Soil and alluvium deposits were found at the bottom of the quarry. The date of the quarry is unknown, but since it cut into one of the shaft tombs, it post-dates them. Phase 3. 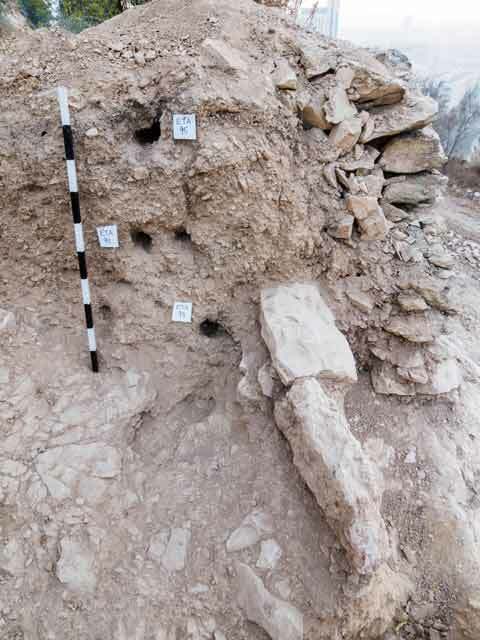 Parts of the foundations of a modern building and a paved road were discovered in the plot of land leveled during modern infrastructure work in the center of the excavation area. The road, which caused extensive damage to the Phase 1 cemetery, ran from the northwest and bended eastward. It was probably constructed during the development work prior to the construction of the Manahat neighborhood in the early 1990s. Once the work was completed, the building was dismantled, and the area underwent landscape restoration. The two areas, which have been were extensively developed, stretch along the upper part of the spur’s rocky eastern slope. Agricultural terraces were discerned on the slope, along with numerous vertical rock walls hewn in the chalk bedrock (Fig. 11) and caves (Fig. 9: Section 4–4). The vertical rock walls were not excavated, since they were in a state of partial collapse as a result of advanced weathering processes; the erosion has rendered any quarrying marks indiscernible. The vertical rock walls were quarried to form the agricultural terraces along the slope. The hard upper nari layer was first cut to create a vertical wall of rock at the back of a broad chalk terrace, which could then be cultivated. The quarrying of the nari layer produced small and medium-sized stones that were used to construct the terrace’s opposite, outer (retaining) wall, which was built of a single row of stones. Once the rock-cutting was complete, the terrace was filled with soil and quarrying waste, which subsequently disintegrated to form a soft chalk soil suitable for farming. This method of quarrying terraces in escarpments of Kefar Sha’ul Formation has been detected at Ramat Rahel, where it creates broad terraces for agricultural purposes. 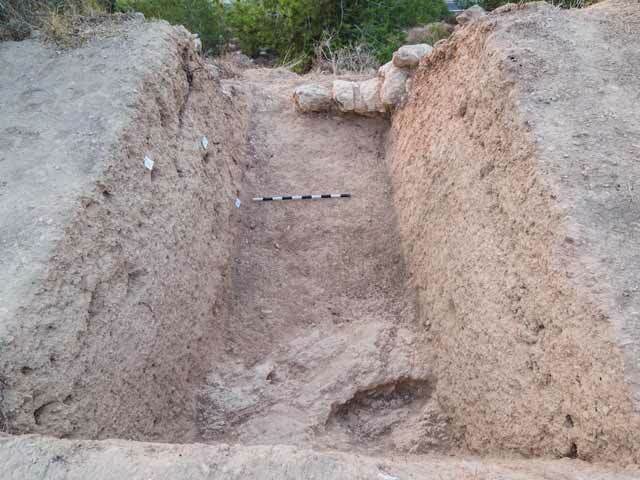 Based on OSL analyses of samples taken from the terraces, they were hewn during the Ottoman period (see below). In the northern part of the upper terrace was a hewn vertical wall with a rectangular niche (L308; Fig. 9: Sections 2–2, 3–3; Fig. 12). This rock wall was cut by quarrying identical to that of the vertical rock walls that formed the terraces. It therefore seems likely that the rock wall with Niche 308 was hewn prior to the installation of the Ottoman-period terraces. A large cave (L313; 5.0 × 5.6 m; Figs. 8, 9: Section 1–1) was discovered to the northeast of the wall. The cave had a wide, east-facing opening, and chiseling marks could be discerned on its southern wall. A wide niche was hewn in its west wall; within the niche was wall built of small fieldstones with bonding material. An opening hewn through the cave’s roof was found at the western end of the niche. Remains of plaster discovered on the walls and floor of the cave indicate that it was used as a dwelling. Traces of camp fires and large quantities of refuse found inside the attest that it is still in use today. Several walls, vertical rock-hewn walls and natural caves were identified on the lower east and southeast slopes. The caves were excavated but yielded no finds or evidence of human activity. The southern part of the area was left completely unexcavated, as the steep slope and its proximity to the road constituted a safety hazard. Four probes (A1, A2, B, C; Figs. 8–10) were opened in the soil fills of three broad agricultural terraces that extend one above the other on the eastern slope of the spur (Areas C–E). 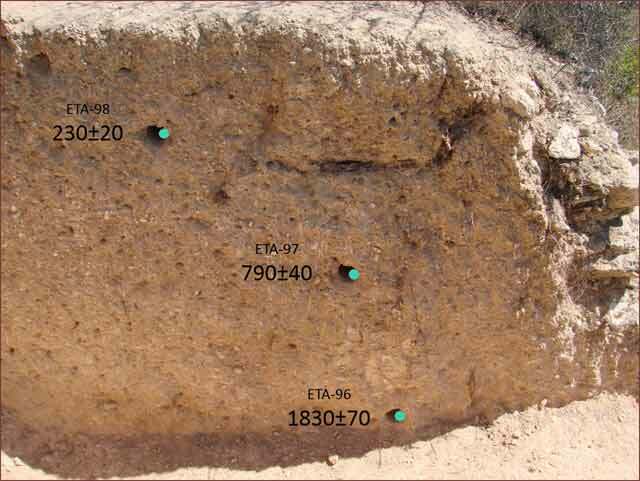 The probes were excavated with the aim of understanding the formation processes of the terraces and their date, using OSL samples. Probe C, opened in the upper terrace, unearthed a wall (W310) and a soil fill that abutted it on the west (L309; Fig. 9: Section 3–3). However, no finds were recovered, and no OSL samples were taken. 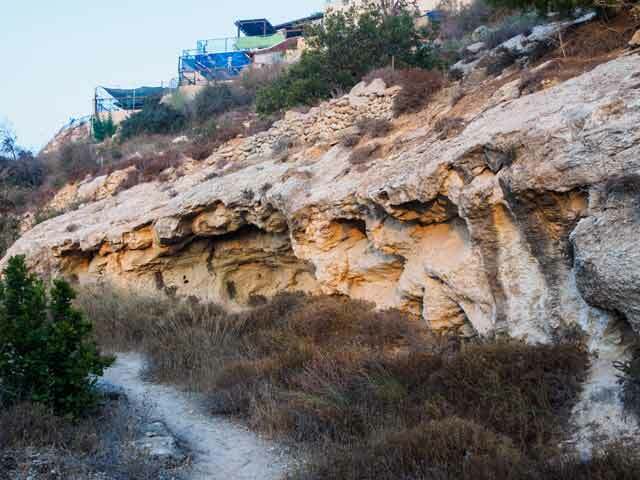 Choosing the location of the probes and tehir excavation were undertaken in collaboration with Y. Avni and N. Porat from the Geological Survey of Israel and Y. Gadot from Tel Aviv University, as part of a terrace-dating project. 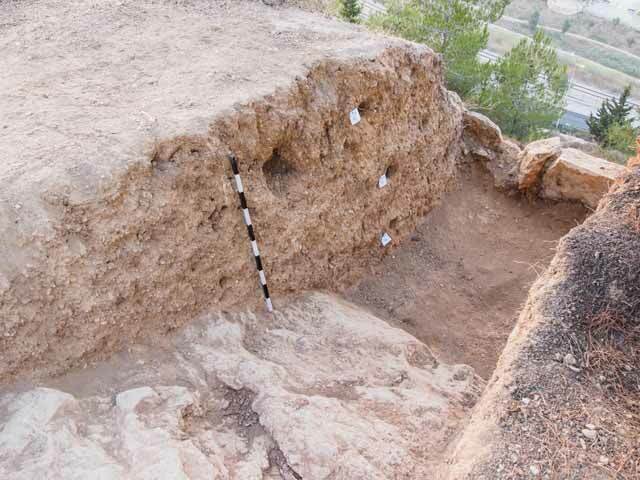 The findings were published in the research report on terrace dating in Nahal Refa’im (Gadot et al. 2015). Probe A1 (2 × 2 m; Fig. 13) was opened in the lower, broadest terrace (width 10 m), which contained a thick layer of arable soil (L307; c. 2 m and more). The soil is made up of crushed soft chalk from the Kefar Sha’ul Formation—debris from quarrying the terraces—mixed with pinkish, clayey granular soil. The unworked Kefar Sha’ul chalk bedrock was reached 2 m below the surface in the northwest part of the probe. The terrace walls were constructed of stones and broken pieces of rock from the nari layer and served to retain the soil fill inside the terraces. The quarrying, the construction of the terrace and filling it with soil—all seem to have been undertaken as part of planned, single project. Nari outcrops, which evolved naturally into an upper crust over the soft Kefar Sha’ul chalk and over human-made rock-cuttings in this rock, could be discerned on the slopes of the spur. Three soil samples were taken from Probe A1 (Nos. 96–98; Fig. 14) for OSL dating. Sample 96, extracted from the bottom of the probe’s section, close to the natural bedrock (1.75 m below the surface), yielded an OSL age of 1830±70, corresponding to the mid-Roman period. Sample 97, taken from the middle of the probe’s section (0.95 m below the surface), provided an OSL age of 790±30, equivalent to the Crusader or Ayyubid periods. Sample 98, taken from near the top of the probe section, (0.4 m below the surface), yielded an age of 230±20, contemporary with the Ottoman period. These results are sound and are compatible with the stratigraphy. Probe A2 was located c. 16 m southwest of Probe A1, and was similarly opened on the lower terrace. It stretches along full its full breadth (2 × 12 m; Fig. 15), between the its retaining wall (W303) and the retaining wall of the terrace above it (W304). The south end of the probe (Fig. 16) yielded fragments of three decorated glass bracelets that are typically found in assemblages from the Mamluk and Ottoman periods and are still worn today (Fig. 17; Ouahnouna, below). Three soil samples were taken from Probe A2 for OSL dating (Nos. 90, 91; Fig. 18). Sample 90, taken from the bottom of the probe’s section (1.3 m below the surface), provided an age of 870±30, corresponding to the Crusader period. Sample 91, taken from the middle of the probe’s section (0.85 m below the surface), yielded an age of 50±10, attesting to a probable modern-day disturbance, which can probably be attributed to development work at the site in the second half of the twentieth century. Probe B (1.4 × 2.0 m; Fig. 15), opened in the middle terrace, was the continuation of Probe A2. Together, the two probes formed a long, narrow trench that cut through the two lower terraces. The middle terrace was narrower (breadth c. 2.5 m) than the lower one. The excavation revealed the retaining wall of the terrace (W304) and its soil fill (L306), which was dug down to the southeast-sloping bedrock. Wall 304 was built mainly of small stones that were probably quarried from the vertical face of the Kefar Sha’ul chalk rock visible above the agricultural terraces. The stones in the wall were haphazardly arranged, and large quantities of quarrying-waste chips were inserted between them on the wall’s inner, north face. The lower part of the wall consisted of a single row of stones, whereas its upper part was built of two rows of stones. The soil in the fill is light brown, and it contains a substantial amount of gravel as well as a few non-diagnostic potsherds and modern finds. When W304 was dismantled, two sections of earlier walls (W311, W312) were revealed; W311 was sealed beneath W304 and incorporated within it, and W312 was sealed beneath the soil fill (L306). These two walls may be the retaining walls of ancient agricultural terraces; if so, they indicate that although the terrace may have been repaired or rebuilt over the years, its location has remained unchanged. Two soil samples for OSL dating were taken from Probe B (Nos. 93, 94; Fig. 19). Sample 93 (0.85 m below the surface) yielded an age of 390±30, and Sample 94 (0.55 m below the surface) yielded an age of 320±40. Both these ages correspond to the Ottoman period (fifteenth–eighteenth centuries CE). Three fragments of glass bracelets were found in the fill of the lower agricultural terrace, on the eastern slope of the spur (L305; Probe A2). They belong to types that were common in the Mamluk period and continued to be in use during the Ottoman period and in modern times (Shindo 2001). The largest production center for glass bracelets during the Ottoman period and twentieth century was most likely Hebron (Spaer 2001:198, 204), as attested by reports of nineteenth century European travelers who visited the Holy Land. The German traveler Ulrich Jasper Seetzen noted that beads and bracelets made in Hebron were sold in the market in front of the Church of the Holy Sepulcher (Seetzen 1854:15); he provided detailed information about the production of bracelets and beads following a visit to Hebron (Seetzen 1854:49). One of the last of these glass workshops is run by the el-Natsha family and continues to produce bracelets and beads to this day (Vincenz 2017). No. 1 (Fig. 17:1; B3020) belongs to the multicolor twisted bracelet type, which is an innovation of the Ayyubid–Mamluk periods. The bracelets were made by twisting two or three, or even more, threads of different thicknesses and colors. Nos. 2 (Fig. 17:2; B3029) and 3 (Fig. 17:3; B3024) are trail-decorated bracelets with an obliquely pointed, somewhat triangular, cross section. They belong to Type C4–D4 in the typology of Spaer (1992:51, Table 3, Fig. 29). Agricultural terraces, retaining walls of terraces, fences, caves and rock-cuttings were documented in the excavation areas. Area B, near the top of the spur, yielded shaft tombs that were hewn in the Intermediate Bronze Age and reused in MB II, as well as a later quarry. The intensive earthworks and development recently carried out across the spur have altered the topography, burying and obliterating some of the ancient remains. It is necessary to understand the geological structure of the various parts of the spur in order to understand the various anthropogenic processes it has undergone over time. 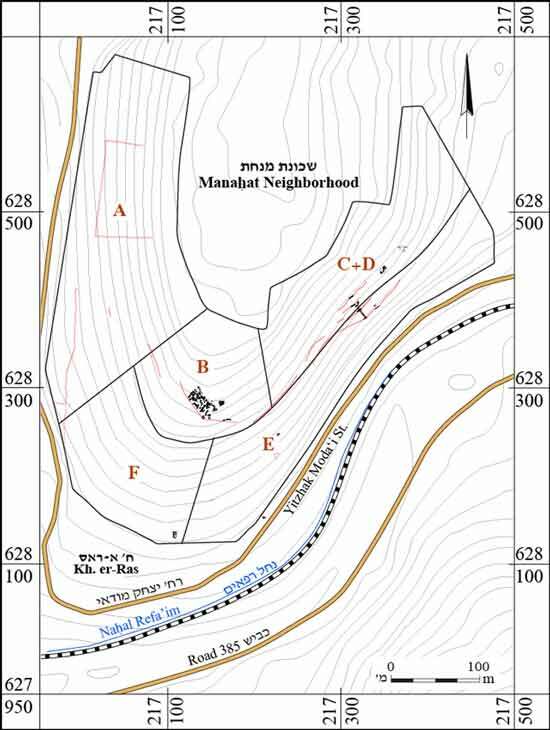 In the Intermediate Bronze Age and MB II, the region of Nahal Refa’im—particularly the section between Beit Safafa and Battir—was an important hub of rural settlement in the central hill-country ridge: two rural settlements with agricultural installations were discovered there, as were two temples (at the Nahal Refa’im site and at Waladje) and four cemeteries containing dozens of shaft tombs (the Holyland compound, Giv‘at Masu’a, the Gillo slopes and the Manahat spur). The settlements’ buildings and agricultural facilities are located on the lower slopes and in the stream’s alluvial fans, where the Moza marl forms easily farmed and gently sloping terraces containing fertile soil. In contrast, the shaft tombs are hewn near the top of the slope, where soft chalk rock from the Kefar Sha’ul Formation allows for easy quarrying; the hard, upper layer of nari ensured that the shafts remained stable. 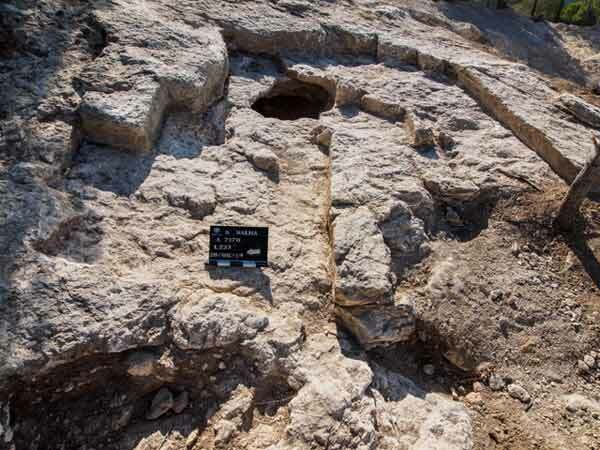 The excavation revealed that the different rock formations lent themselves to different uses in antiquity and determined the location of a settlement’s various parts. Based on the findings of the OSL samples, the construction of the agricultural terraces on the spur’s east slope can be attributed to four periods: Roman, early Medieval (Crusader/Ayyubid periods), Ottoman and modern. The Roman terraces may be linked to villas from the period that were excavated near Nahal Refa’im, southwest of the spur, near ‘En Ya‘el (Edelstein 1994; Weksler-Bdolah 2007; Avner 2015). The terraces from the early medieval period may be associated with the original tenant farmers who cultivated the lands belonging to the Monastery of the Cross. Official imperial documents from the Ottoman period, together with contemporary eyewitness accounts and maps, attest to the construction of a system of agricultural terraces and the existence of a thriving village on the spur. During the Ottoman period, wide agricultural terraces were quarried into the Kefar Sha’ul rock on the spur’s east slope. During the course of this quarrying, the full potential of the rock was exploited: stones were hewn from the nari layer to build the retaining walls of the terrace, stone chips and quarrying waste were incorporated between the stones of the walls to reinforce them, and the chalk rock that was hewn beneath the nari became part of the terrace fill. In the second half of the twentieth century, accelerated construction on the spur and extensive landscape restoration on its slopes destroyed some of the ancient remains. Avner R. 2015. Jerusalem, ‘En Ya‘al. HA-ESI 127. Clermont-Ganneau C. 1899. Archaeological Researches in Palestine during the Years 1873–1874 I. London. Department of Statistics 1945. Village Statistics. Jerusalem‎. Edelstein G. 1982. Jerusalem, Kh. er-Ras. HA 77:28–29 (Hebew). Edelstein G. 1993. A Roman Villa at ‘En Yaʻel. Qadmoniot 103–104:114–119 (Hebrew). Edelstein G. 2000. A Terraced Farm at Er-Ras. ‘Atiqot 40:39–63. Edelstein G., Milevski I. and Aurant S. 1998. 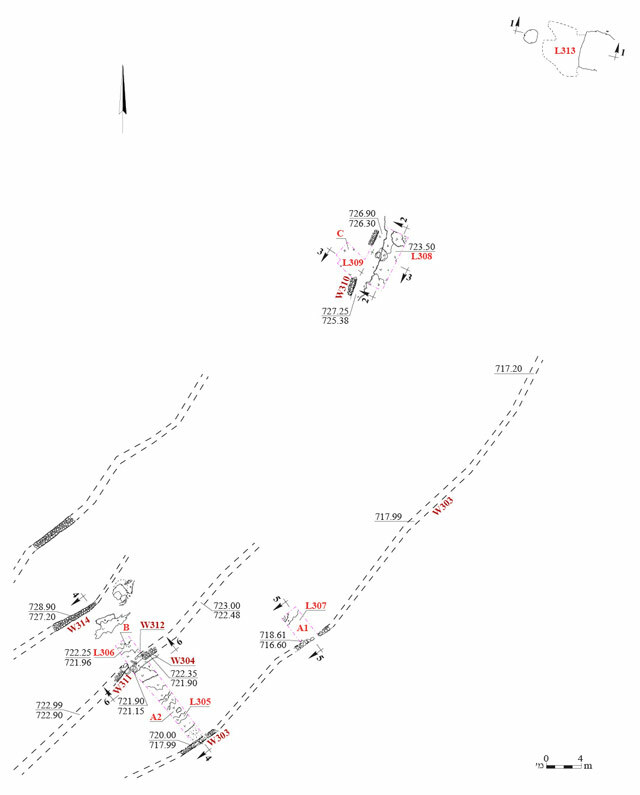 Villages, Terraces and Stone Mounds: Excavations at Manahat, Jerusalem, 1987–1989 (The Rephaim Valley Project) (IAA Reports 3). Jerusalem. Eisenberg E. 1993. Nahal Rephaim — A Bronze Age Village in South-Western Jerusalem. Qadmoniot 103–104:82–95 (Hebrew). Feig N. 1996. New Discoveries in the Rephaim Valley, Jerusalem. PEQ 128:3–7. Feig N. 2016. Khirbat er-Ras, Jerusalem: Iron Age and Ottoman-Period Remains. HA-ESI 128. Gadot Y. 2011. The Rural Settlement along Nahal Repha’im from the Middle Bronze Age until the Hellenistic Period: A Fresh Look from Kh. Er Ras. In E. Barukh, A. Levi-Riefer and A. Faust eds. New Studies on Jerusalem 17 (Proceedings of the Seventeenth Conference, Bar-Ilan University). Ramat Gan. Pp.43–61. Gadot Y. 2015. In the Valley of the King: Jerusalem’s Rural Hinterland in the 8th–4th Centuries B.C.E. Tel Aviv 42:3–26. Gadot Y., Davidovich U., Avni G., Avni Y., Avrham A., Kisilevitz S., Ein-Mor D. and Porat N. 2015. 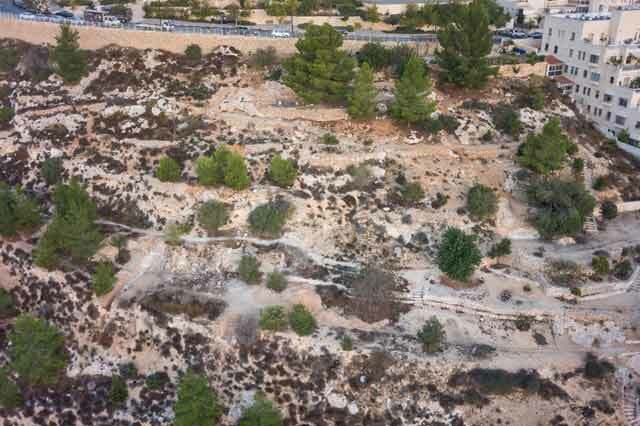 The Formation of a Mediterranean Terraced Landscape: The Case of Nahal Refa’im, Jerusalem. In G.D. Stiebel, O. Peleg-Barkat, D. Ben-Ami and Y. Gadot eds. 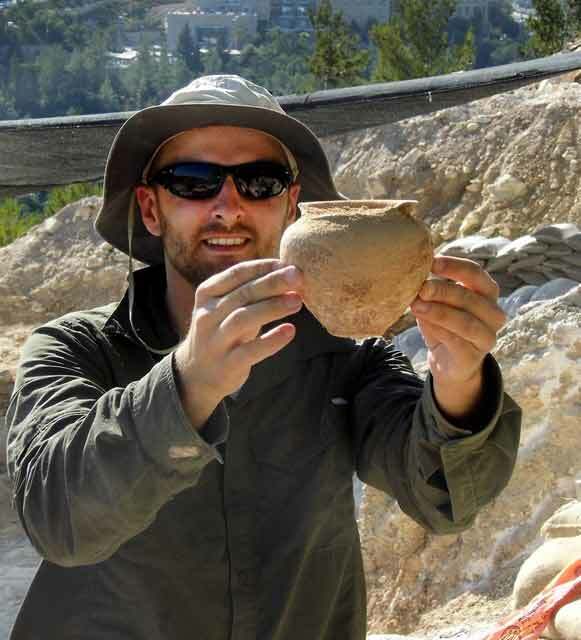 New Studies in the Archaeology of Jerusalem and its Region. Collected Papers 9. Jerusalem. Pp. 118–142 (Hebrew). Gibson S. and Barkay G. 1977. Qiryat Yovel—Manahat. HA 61–62:30–31 (Hebrew). Greenhut Z., Milevski I and Agha N. 2008. 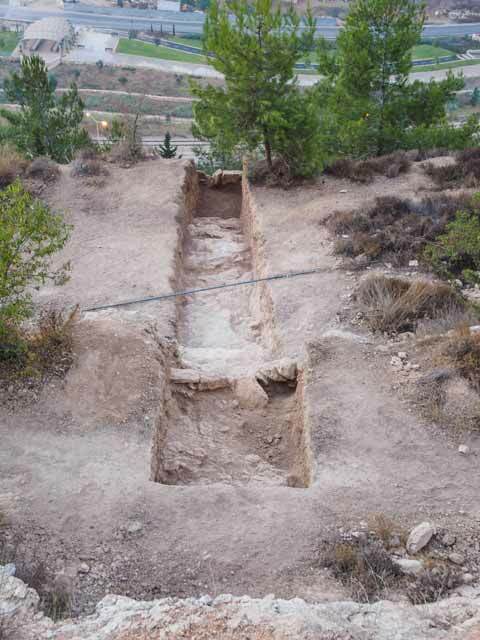 Excavations in the Holyland Compound – A Bronze Age Cemetery in Nahal Refa’im Valley, West Jerusalem. In D. Amit and G.D. Stiebel eds. 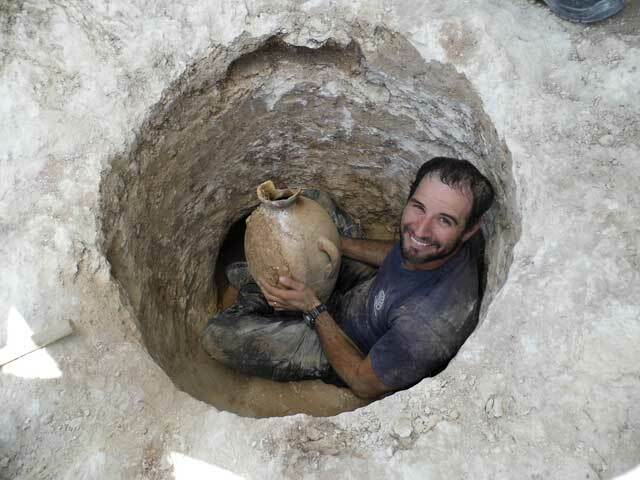 New Studies in the Archaeology of Jerusalem and its Region. Collected Papers 2. Jerusalem. Pp. 73–87 (Hebrew). Ηütteroth W.-D. and Abdulfattah K. 1977. Historical Geography of Palestine, Transjordan and Southern Syria in the Late 16th Century (Erlanger Geographische Arbeiten, Sonderband 5). Erlangen. Seetzen U.J. 1854. Reisen durch Syrien, Palästina, Phönicien, die Transjordan-Länder, Arabia Petraea und Unter-Aegypten I (F. Kruse ed.). Berlin. Shindo Y. 2001. The Classification and Chronology of the Islamic Glass Bracelets from al-Tūr, Sinai. In T. Nishio ed. Cultural Change in the Arab World (Senri Ethnological Studies 55). Osaka. Pp. 73–100. Spaer M. 1992. The Islamic Glass Bracelets of Palestine: Preliminary Findings. JGS 34:44–62. Spaer M. 2001. Ancient Glass in the Israel Museum: Beads and Other Small Objects (Israel Museum Catalogue 447). Jerusalem. Vincenz A. de 2017. Ottoman Pottery and Glass Bracelets from Yafo (Jaffa), Jerusalem Boulevard and its Vicinity. ʽAtiqot 88:115–129. Weksler-Bdolah S. 2007. Jerusalem, ‘En Ya‘el. HA-ESI 119. Weksler-Bdolah S. 2017. 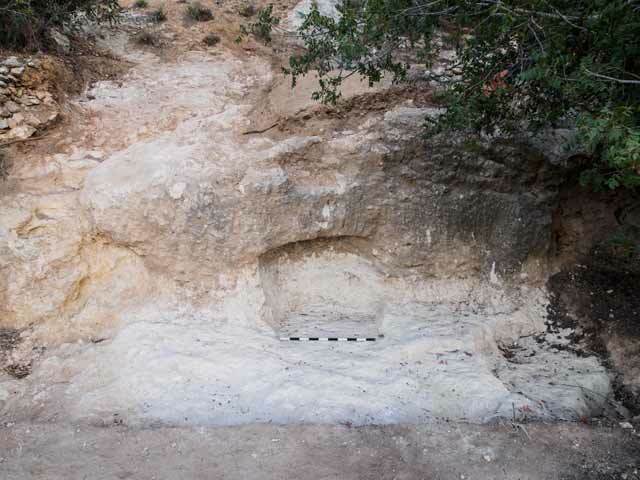 Intermediate and Middle Bronze Age Burial Cave 900 in Nahal Refa’im, Jerusalem. ‘Atiqot 88:17–32. Wiegman A. 2013. Survey at Malcha (Development Survey; Archaeological Survey of Israel). Zagareli A. and H. Guthe 1888. Grusinische Kolonisten in Palästina. ZDPV 11:259–260. Zehavi A. 1994. Jerusalem, Manahat. ESI 12:66–67. Zilberbod I. and Be’eri R. 2017. Jerusalem, Gillo. HA-ESI 129. 2. Area A, wall delimiting agricultural terrace, looking west. 3. Area B, aerial view of rock-hewn shaft tombs, looking northeast. 4. Area B, in situ closing stone, looking north. 5. Area B, intact hemispherical bowl found at bottom of a tomb. 6. Area B, intact jar from a tomb. 7. Area B, quarry cutting into shaft tomb, looking east. 10. Areas C–E, east slope of spur and probes, looking northwest. 11. Areas C and D, vertical rock-hewn chalk walls, looking northwest. 12. Areas C and D, niche hewn in vertical rock wall, looking northwest. 13. Probe A1, looking southeast. 14. East section in Probe A1, looking northeast. 15. Probes A2 and B, looking southeast. 16. South part of Probe A2, looking east. 17. Fragments of glass bracelets from Probe A2. 18. East section in Probe A2, looking east. 19. East section in Probe B, looking northeast.